NEW YORK - Killing civilians was "standard operating procedure" for the Palestine Liberation Organization and Palestinian Authority during Yasser Arafat's reign in the early 2000s, an attorney representing American victims of Palestinian terrorist attacks told a jury Tuesday. Kent Yalowitz began his opening statement by describing a cold, rainy day in Jerusalem in March 2002 when Alan and Yonni Bauer were struck by shrapnel sent flying by a suicide bomber. "The scene was chaotic," Yalowitz said, "filled with smoke and fog." The bomber was a former Palestinian police officer who was helped by other Palestinian Authority officials in plotting the attack, Yalowitz said. The PA continues to pay his family for his martyrdom. Those convicted of helping plot the attack also stayed on the government payroll. "These were not rogue employees," Yalowitz said. The evidence will show that the PA facilitated the attacks through its own policies and practices, by providing material support to the terrorist plotters and by its own words glorifying the attacks and those responsible. The payments to the terrorists' families and to PA officials convicted in Israeli court for related crimes are described as "for those struggling against the occupation." Another recipient, Abdullah Barghouti, was arrested by Palestinian police in 2002 for plotting a suicide bombing. Yalowitz showed jurors an exhibit, an internal PA document, in which Yasser Arafat, the longtime leader of the PLO and the PA, is notified about Barghouti's arrest before the attack. Barghouti's freedom, it says, is "at your Excellency's discretion." He was released and given support for "a killing spree" that left 66 people dead. Nine of those victims were inside a Hebrew University cafeteria when a bomb Barghouti made blew up. The dead included four Americans. "Four of my client families lost a child or a sibling that day," Yalowitz said. 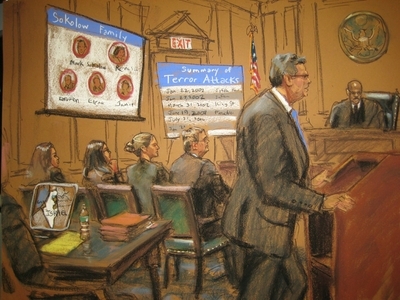 The families are seeking $1 billion in damages under the U.S. Antiterrorism Act, a figure that could multiply with punitive damages and other assessments. An hour after describing the attack that injured the Bauers, Yalowitz stood silently as slides showed pictures of those killed in the attacks and their families in happier times. Many will take the stand to describe the attacks and the toll taken on their families. "You're going to meet them and you're going to see they're still trying to pick up the pieces," Yalowitz said. Mark Rochon, leading the PA's defense team, said he was not there to contest that point. "These acts happened," he said. "These acts were horrific. These acts are condemnable. They were wrong. Intolerable." But they were not the responsibility of the PLO or the PA, Rochon said. In three attacks at issue in the lawsuit, no PA employees were implicated. In the others, he minimized the PA employees as acting "for their own reasons, crazy, wrong, contemptible. But not [at] my clients'" direction. He acknowledged the emotional nature of the case, but urged jurors to "take a deep breath" and see if the evidence does show the PA and PLO are liable. He minimized the monthly payments sent to martyrs' families and to those PA employees convicted in connection with terrorist crimes. Martyrs' families receive $100 a month, Rochon said. That kind of money isn't going to spur someone to blow him or herself up. It's also not unusual for any entity in a conflict to continue to support its people, even if they're in confinement. "John McCain didn't lose his rank or his [salary] when he was locked up by the Vietnamese," Rochon said. He also tried to undercut a series of expert witnesses who will testify for the victims, suggesting they offer nothing more than opinions which may be rooted in bias. After the opening statements, Israeli citizen Meshulam Pearlman testified about seeing a 2004 suicide bombing on a bus in Jerusalem. Pearlman was hanging plants outside his flower shop that morning when he heard the explosion and saw the bus's roof blow off amid a red and white explosion. He described the body parts and seeing people cut in two. Jurors saw images of the aftermath, the bus's shell and images of first responders tending to the wounded, while religious officials gathered the victims and the scattered body parts. Four PA police and security officials later admitted to participating in the plot and making the bomb, the lawsuit says. Testimony resumes Wednesday. The trial is expected to last six to eight weeks.